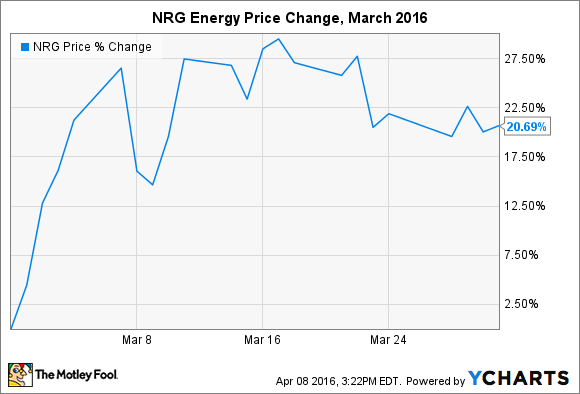 NRG Energy had a great run last month. Here's what you need to know. What: Shares of renewable energy-focused power company NRG Energy (NYSE:NRG) rocketed 21% in March on increased investor optimism from 2015 earnings results, 2016 guidance, and the announcement of two new projects, including a major solar partnership with Whole Foods Market. So what: March started off on the right foot when NRG Energy announced full-year 2015 financial results on the last day of February. The company notched record full-year adjusted EBITDA of $3.3 billion and accelerated its debt reduction efforts. The latter will result in a slightly reduced quarterly dividend, from $0.14 per share to $0.12 per share. Investors still enjoyed the progress, which gives confidence that NRG Energy remains on solid footing for the future. Meanwhile, NRG Energy and Whole Foods Market announced plans for a commercial solar portfolio that will install rooftop solar at up to 84 grocery stores and distribution centers in nine states. The installations will be able to generate up to 13.8 MW of solar power and help to lower Whole Foods Market's carbon footprint. To put that into perspective, SolarCity and Wal-Mart have installed over 65 MW of rooftop solar on stores since 2010, which hints that NRG Energy and Whole Foods Market could enjoy a fruitful long-term partnership. Now what: Investors have stomached plenty of volatilty in recent years. After peaking at over $37 per share in mid-2014, shares of NRG Energy collapsed all the way to $9 in late 2015 after its longtime CEO stepped down. While challenges remain for the company, I think there's a solid case to be made for this being a value play for long-term investors.